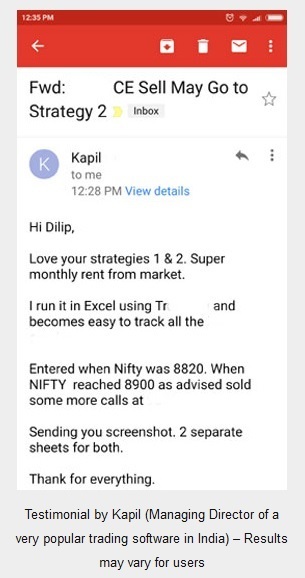 As I said in my yesterday’s email there will not be much movement in Indian Markets – Nifty or the Bombay Stock Exchange. Both are just 0.25% up than yesterday’s close. This is not a significant move. Today the RBI (Reserve Bank of India) will announce its monetary policy at 2.30 pm India time. This is unlike earlier times when they announced at 11.00 am India time. Another difference is earlier the rate hike call was taken by only the RBI Governor. But from now onward it will be taken by the Monetary Policy Committee (MPC) headed by RBI Governor. Right now RBI Governor is Mr. Urjit Patel. Whatever the Committee decides Mr. Urjit Patel will announce exactly that. Monetary Policy Committee (MPC) is a six-member panel which has equal representation from RBI and the government. If you remember since the start of last year RBI has cut the repo rate five times. Repo rate is the rate at which Reserve Bank of India lends money to recognized banks in India. Repo rate depends a lot on Retail Inflation. Retail Inflation is the average of all Inflation among all the products sold in India to people like us – not the Inflation for the brokers or whole-sellers. It is the price increase when the product is ultimately delivered to customer from a shop from year to year. Assuming that rice producers paid last year Rs.100/- for 1 kilo of Basmati Rice to the farmers and sold it for Rs.101/- to brokers or whole sellers who then sold the same to shopkeepers for Rs.110/- per kilo who then sold to customers for Rs.120/- per kilo. And in this year assume that rice producers paid Rs.100/- for 1 kilo of Basmati Rice to the farmers and sold it for Rs.102/- to brokers or whole sellers who then sold the same to shopkeepers for Rs.115/- per kilo who then sold to customers for Rs.125/- per kilo. Then the inflation will increase by (5/120)*100 = 4.16%. As you can see there was ZERO inflation for rice producers but a 4.16% increase for retail buyers, so the government will consider an inflation of 4.16% in Basmati Rice. Like that average inflation of nearly all products sold to retail customers is taken into account before announcing the real Retail Inflation. Based on this the RBI decides the lending rate or the Repo Rate. India’s retail inflation has touched a five-month low of 5.05 percent in August 2016. This may let the Monetary Policy Committee (MPC) lower the Repo Rate by 25 basis points or let it remain unchanged. In any case markets will not move much. Hope how Inflation is decided and how the Repo Rate is decided is now clear to you. 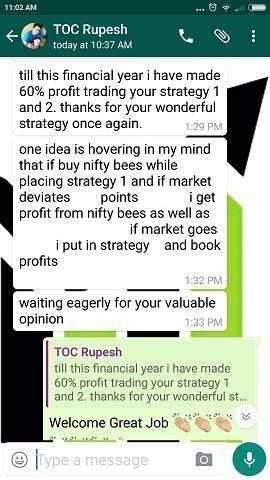 Now advise for people who have done my Option Trading Course. INDIA VIX is at 15.49% or just 0.83% below yesterday’s close. Which clearly indicates markets are not expecting much from the RBI announcement at 2.30 pm today. But please do keep an eye on the trades that are on. 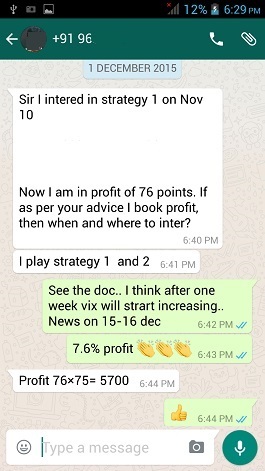 My focus is on Strategy 1 which makes money almost every time its traded. 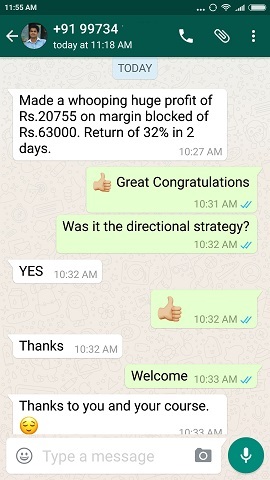 If you see a reasonable profit at 2.00 pm exit the trade and book profits. You can then later enter as written in the document. 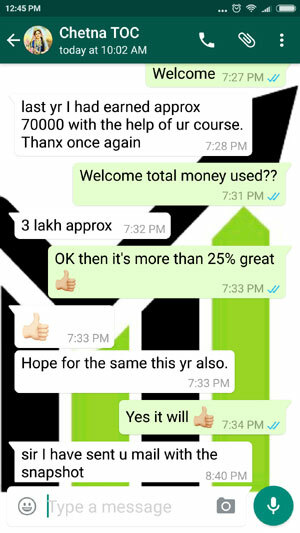 Get Option Course Details Here.